Fleet managers have voted the BMW 5 Series the best new company car, while BMW has been named fleet manufacturer of the year. The two headline Fleet News Awards are voted for in an online poll by fleet manager readers, where only those with responsibility for their company fleet are sent a unique code with their copy of Fleet News allowing them to take part and to vote just once. Most of the awards are voted for by panels of experts, whose criteria include a combination of whole life costs, tax liability, safety, reliability, manufacturer back-up and driver appeal. Discussions are audited by Deloitte to ensure the judging process has been fair and unbiased. On the two headline award wins, Fleet News editor-in-chief Stephen Briers said: “The BMW 5 Series has been freshened with a broader range of diesel versions which reduce running costs, but one thing that hasn’t changed is its peerless driver appeal. 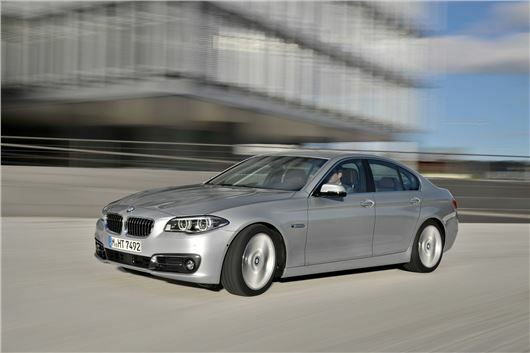 The 5 Series remains the benchmark in the sector. The BMW 5 Series, revised in summer 2013, also won Best Executive Car, while the i3 took the Best Ultra-low Carbon Car Award. BMW was also chosen as the Green Fleet Manufacturer of the Year. Citroën’s Grand C4 Picasso was awarded Best Seven-seat People Carrier, while the Land Rover Discovery won Best All-round 4x4. Mercedes-Benz picked up two awards: the S-Class took the Best Chauffeur Car award, while the company was also judged to be the Most Improved Fleet Manufacturer.